“Mad as a March hare,” that’s how the old saying goes. Crafty fly tyers may litter their vises with March Browns to celebrate the beginning of spring. Smaller males surround a larger female carp on their way up the Los Angeles River. (Derek Bourassa). And for those of us plying urban waters, it’s time for the semi-annual parade of the carp. “I think they end up in Balboa Lake. I’ve spotted some huge fish in there,” guide David Wratchford told me yesterday at the Fisherman’s Spot. That would be miles, and miles, and miles upstream from where they begin the migration, probably in the Glendale Narrows. Earlier in the week, he’d left me a voicemail — with some urgency — that the spawn was on. 39 degrees Carp begin active feeding. 41 degrees Carp begin pre-spawn move to shallows. 61 degrees Sustained temp lethal to carp eggs. 63 degrees Probable lower limit for spawning. 66 degrees Optimal temp for carp. 72 degrees Metabolism increases rapidly. 75 degrees Probable upper limit for spawning. 79 degrees Sustained temps lethal to carp eggs. 90 degrees Metabolism at a high rate. 97-106 degrees Lethal temp limit for carp. So, once Mother Nature’s spring water thermometer hits the correct temperature, the carp are off and running. And do they ever run, up into the shallows, and the concrete steps that dot the semi-natural surface of Glendale Narrows and beyond. 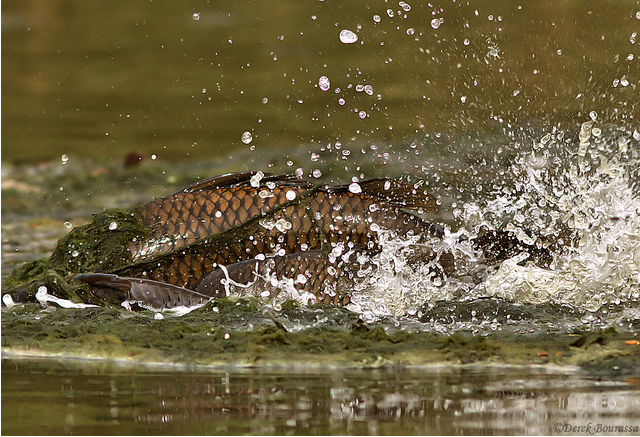 If the March hare’s madness springs from its wacky mating behaviors — including jumping into the air for no apparent reason — the same holds true for carp. “I saw sea gulls attacking a whole group of them. The fish were almost completely out of the water. I don’t know. It looked like they were trying to pluck out their eyes,” said one old timer I met yesterday. Another younger guy, dressed in surgeon’s scrubs, told me he thought he’d seen a rock on one of the concrete flats. That rock, of course, turned out to be a monster carp. “Its back was completely dry,” he said, and added that he couldn’t resist picking it up, then setting it back down in the water. I met him and his two friends with poles in hand, hoping to find more spawning carp. What does this mean for you? Get fishing before the weather turns. Take advantage of this fine spring weekend. Heck, you might even exchange your normal Glo-Bug for a Mad March Hare’s Ear.